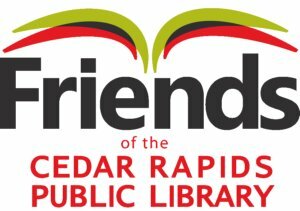 Friends supports the Cedar Rapids Public Library services and programs, promotes literacy through outreach programs that encourage and enhance reading throughout the community and conducts fundraising activities to assist with library and outreach projects. All proceeds from our Book Nooks also go to benefit the libraries in our network! All books at our Book Nooks have great books and media for all ages at a fixed price. All items are $1.00 with the Nook at the entrance. All items are $2.00 with the Nook across from the main stairs on the first floor. Support the Friends of the CRPL and get a great read at the same time by attending one of their regularly scheduled book sales throughout the year. Please join us for any of our upcoming book sales to support the Cedar Rapids Public Library! The Friends of the Cedar Rapids Public Library typically have a large Fall Book Sale at the Cherry Building (located at 329 10th Avenue SE) in November. Check back here for more information closer to the fall. For more information about book sales or volunteering, please email crfriends@gmail.com. In the Fall, Friends of the Library hosts a major fundraiser – the Annual Book Sale. More than 80,000 donated books of quality are available for purchase at very affordable prices. We partner with various Cedar Rapids’ locations to make our sales easily accessible. Proceeds from this event, plus membership contributions, corporate support, memorials and grants allow Friends to continue to provide valuable support to one of Cedar Rapids’ greatest resources – the Public Library. The Friends of the CRPL encourage you to drop your donated books and media at the Downtown Library, located at 450 Fifth Avenue SE. They can be put directly into the RETURNS, either through the drive-up or once inside the building. If you have a large quantity of books and/or media you will be dropping at the Library, please contact the Friends of the CRPL at CRFriends@gmail.com. Due to the high costs of recycling and trash removal, we ask that you limit your donations to items we can sell – things that you’d be willing to buy. No broken spines or missing covers. No torn, missing, marked, or highlighted pages. No stained, moldy, or wet pages; no books with bad odors. No 8-Tracks, records or cassette tapes. No encyclopedias, except Britannica, and none older than 5 years from the current year. No text books older than 5 years from the current year. No condensed books of any kind. No Iowa Code books, except current year. No homemade tapes or videos. Please do not leave boxes of books outside the donation box.